One of the can't miss attractions at New York Comic Con for Star Wars is the The Last Jedi booth on the convention. While there will be no The Last Jedi panel during the con, the booth does give fans a sneak peak at some of the costumes, props, and models that we will be seeing up on the big screen this December. While there aren't any major reveals (the focus is mainly on things that have already been revealed in the marketing), the booth is a fun way to get a good look at some new Star Wars items. Check out the Instagram galleries below to get a peak inside the booth! Supreme Leader Snoke's elite Praetorian Guards were a definite focus of the booth, with several of their weapons and one of their helmets on display. One fun tidbit hidden in the display is that there are only eight of them total in Snoke's service. Another interesting tidbit was revealed about Kylo Ren. On the placard for the model of Kylo Ren's TIE Silencer it reveals that Kylo inherited Han's piloting skills, although he uses them for evil. It will be interesting to see Kylo's skills in action in The Last Jedi. 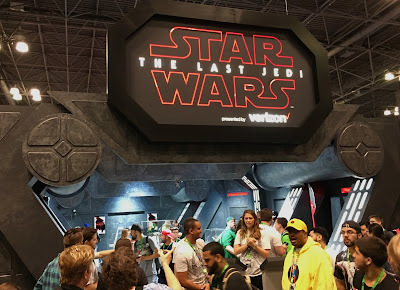 While it would have been nice to have a The Last Jedi preview panel at NYCC (especially if the rumors about when the next trailer is coming), the booth was a nice surprise and a can't miss for Star Wars fans this weekend. Make sure you're following @TheSWU on Instagram and Twitter throughout the weekend for more updates from New York Comic Con!